David Wise is a British composer known for his composition on Rareware productions such as Battletoads and Donkey Kong Country. 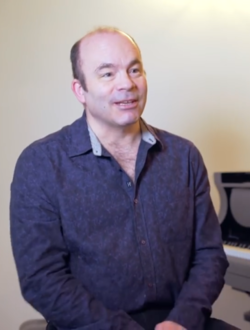 He composed the majority of the soundtrack of Donkey Kong Country score (with help from Eveline Fischer and Robin Beanland), and would later compose the entire Donkey Kong Country 2: Diddy's Kong Quest score. David Wise had a limited involvement with Donkey Kong Country 3: Dixie Kong's Double Trouble!, which was mostly composed by Eveline Fischer. He later composed an entirely soundtrack for the Game Boy Advance port. David Wise later composed the soundtrack for Donkey Kong Country: Tropical Freeze. David Wise left Rare in 2009, and he currently runs his own independent sound studio. This page was last edited on February 27, 2019, at 01:45.